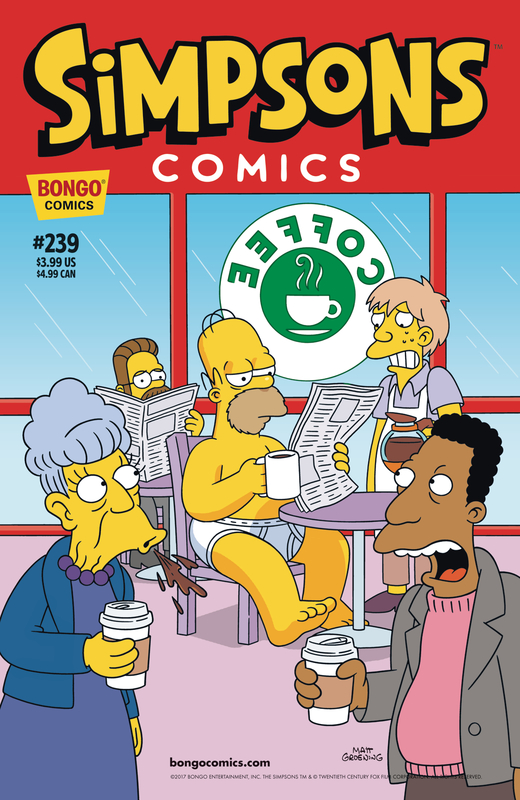 Simpsons Comics #239 is the two hundred and thirty-nineth issue of Simpsons Comics and is was released in May, 2017. "After Lisa gets billed for excessive usage of the free and unlimited Wi-Fi at Krusty’s Brew Ha Ha (which is neither free or unlimited), the Simpsons enter the barista biz by turning their home into a Krusty coffeehouse franchise to pay off her court-ordered debt. It’s a caffeinated comic tale, roasted and brewed to percolated perfection." Main article: Brew Ha Ha! Modified on July 24, 2017, at 16:18.